CornerVine Inc. | CornerVine Inc.
CornerVine helps you engage your customers when they're in your store and keeps you connected with them each time they walk out the door. You've worked hard to create an inviting environment for your customers where they feel welcome, where they enjoy interacting with your employees, and where they look forward to coming back because of the relationship you've built with them and the experience you provide for them when they come into your store. CornerVine provides you with tools to enhance your customers' in-store exprience and extend that experience for your customers outside the store so you don't have to wait until the next time they come through your doors to engage them, educate them, and provide them the unique experience that keeps them coming back. It also gives you more ways to sell more of the products your customers are already buying from you. And in an increasingly mobile-centric world, CornerVine gives you a native application experience to give to your customers that keeps you on top of current technology and ahead of your competitors. 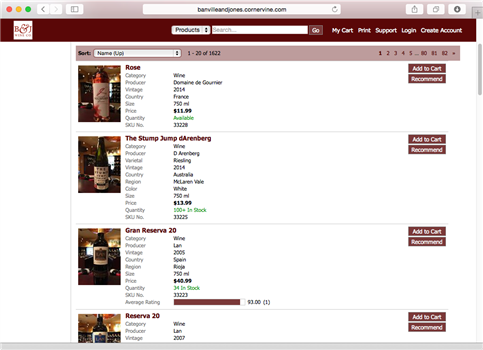 CornerVine automates the process of getting all your store's wine, spirits, and beer online. When you add new products to your system, CornerVine automatically detects them and adds them to your CornerVine site. When new inventory arrives or if products become unavailable, CornerVine automatically updates your site so your customers know what -- and how much -- is available. Use the Browsing utility in your custom mobile app to let customers quickly narrow down what they're looking for based on taste profile, country, price, etc. Allow your customers to scan product barcodes or your pricing label barcodes to quickly pull up additional information about a product they're looking at. Leverage your employees' expertise by adding their ratings and notes to your products so your customers see these automatically when looking at a product. 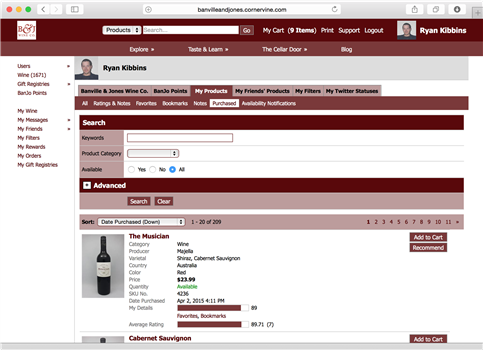 Allow your customers to see which wines, spirits, and beers they've bought from your store. Take away the need for them to remember what they bought and when they bought it. Within minutes of making a purchase, the information is automatically added to your customers' CornerVine profiles. If you are already tracking purchases for your customers, CornerVine can give your customers access to their purchase histories for as long as you've been tracking them, regardless of when they create an account. Your customers can quickly add a rating to any product on your site, not just the ones in their purchase list. They can supplement their rating by including tasting notes, food pairings, reminders, etc. As their list of ratings and purchases grows, they can group them into user-defined lists, making them easier to find and remember. Your customers can share their ratings with everyone or with just a specific groups of friends. Users can turn on notifications so they receive email or mobile push notifications whenever their friends rate new wines. 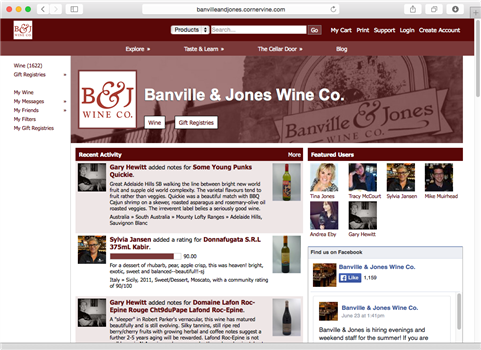 Friends can recommend your store's wines, spirits, and beers to each other directly through your CornerVine site. Customers who wish to use CornerVine on their own can keep their profiles completely private. CornerVine is optimized for any device your customers are using. Our mobile web version works on most Apple, Android, Blackberry, and Windows Phone devices. Our native mobile applications include a native iOS app available through the Apple App Store (available now), and a native Android app available through Google Play (available Q4 2015).